And that thing was the filming location at the 21 second mark, where there is a tail view of the car driving along the coast. 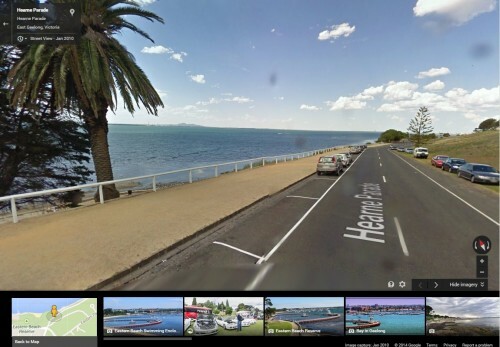 Yep – by the water in Geelong, with the car driving along Hearne Parade with Corio Bay in the background. Skip forward to another day, and another ‘I bought a Jeep’ commercial, with another familar looking location. This time it is a car driving over a bridge at the 24 second mark, followed by a parting shot of the same bridge. Blackgate Road in Connewarre, with the bridge crossing over Thompson Creek. You can take the boy out of Geelong, but you can’t take Geelong out of the boy! Mr Wong! I’ve lost my travellers cheques! I was wondering where that bridge was – an example of late 1950’s/early 1960’s CRB design that never had the rails painted white (later white and grey) or the deck asphalted over. Another I am more familiar with is the old Wells Road bridge over the Patterson River in what is now Patterson Lakes, but was built long before the adjacent freeway or surrounding suburb was developed. A distinctive feature of the Thompson Creek bridge is the concrete deck – it doesn’t have a single slab on top, but has the individual beams exposed. I can’t think of any other bridges I’ve seen like it. 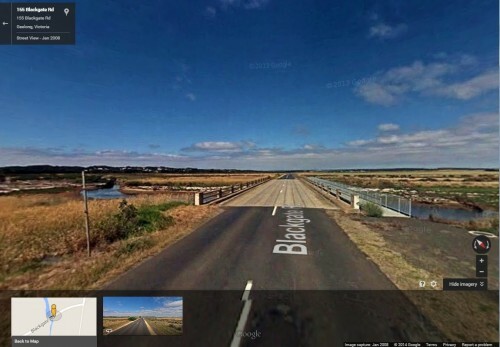 Bream Creek – Torquay-Barwon Heads Road, Shire of South Barwon: A six-span precast high strength U-slab and reinforced concrete bridge, 180 feet long by 28 feet between kerbs. It could be worse, she could be an aggro woman driving a Kia and not looking where she is going. Don’t forget the Volkswagen douchebag stereotype!